Does the pedigree of a thoroughbred racehorse still matter? You may have heard that a horse named Nyquist won the Kentucky Derby recently. Nyquist was the favorite going into the race, though he was not without his doubters. Many expert race prognosticators questioned his stamina, and I was curious about the basis for those comments. My due diligence revealed that breeders (and race handicappers) have a language of their own when speaking of these great thoroughbred horses. For example, in evaluating a horse’s potential, they speak of “dosage,” which at first glance appears to imply the use of performance-enhancing drugs. However, this is a term used (at least) since the earliest part of the 20th century (in France and England), and it refers to the horse’s pedigree. Dosage. A system designed to predict the distance potential (stamina) of horses based on the sires in the first four generations of their pedigrees. Categories range from most speed/least stamina to least speed/most stamina, and points are assigned over this range to form the Dosage Profile. 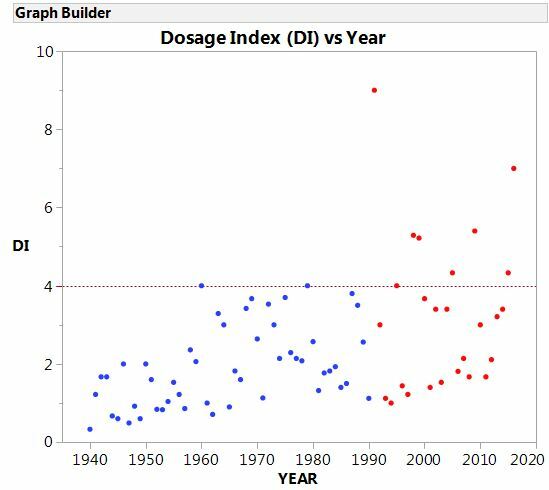 The Dosage Index (DI). DI is the ratio of points in the “speed wing” to points in the “stamina wing.” The average DI for race horses in North America is 2.4. Nyquist’s DI is 7, indicating that he has 7 times as much speed as stamina in his pedigree. Since 1940, there has only been one other horse (Strike the Gold, 1991) with a DI higher than 7! Center of Distribution (CD). CD provides a point of reference relative to the horse’s pedigree with a metric ranging from +2.00 to -2.00. A positive CD indicates the horse has speed (in the pedigree), and a negative CD indicates the horse has displayed more stamina. The average racehorse in North America has a CD of 0.70. Nyquist’s CD is 1, indicating that he should have more speed than the average horse. 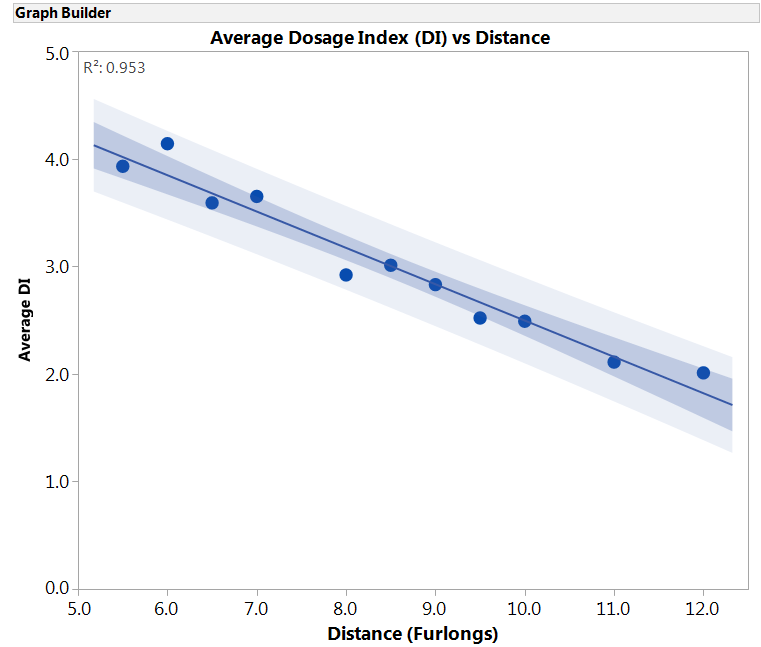 The fundamental theory behind dosage is that the higher the DI and CD, the lower the distance potential of the horse; conversely, the lower the DI and CD, the higher the speed potential of the horse. The rule of thumb has been that a horse with a DI higher than 4.0 and a CD higher than 1.25 will not perform well and would not win the Triple Crown races like the Kentucky Derby, the Preakness or the Belmont Stakes. For 50 years, this rule of thumb appeared to be valid, as there were only two race winners with a DI of at least 4 from 1940 to 1990, but something changed the game in 1991. In 1991, a horse named Strike the Gold kicked down the barn door of pedigree metrics and ushered in a new era in high-stakes horse racing as he won the Kentucky Derby with a DI of 9. I sought to analyze this change using control charts from JMP’s Quality and Process platform. Control charts use the data to differentiate what is typical from what should be considered special. In creating my control chart, I realized that 1991 wasn’t the first time that such a change had occurred since 1940; it’s just the first one that emphasized that something was rendering metrics like DI and CD outdated. In the chart below, note the change in the average values of DI per each time period. What’s causing these changes? New training methods? Something else? Given what we have seen in Kentucky Derby winners since 1940, can we throw out the historical data in this post-1990 world of racing? Does the DI rule of thumb still hold true? And, does pedigree still matter in the world of horse racing? Here’s a graph depicting more than 30,000 horse races since 1980, and it indicates that the rule of thumb still holds true: The longer the race, the lower the DI. The DI metric has seen some interesting activity in the Preakness as well. But since 1990, it’s actually been trending lower. And since 1940, the average DI for the Preakness (a 10-furlong race) winner is 2.82, and that’s a number falling within historical expectations (according to the chart above). For more than 50 years, racehorses in the Kentucky Derby behaved as expected relative to their pedigree-related metrics. At least in the Kentucky Derby, something has apparently changed, and horses that previously would not have even been considered contenders have been winning! Might it be better training methods enabling speed horses to be better trained to run the distance? Might it be drugs? What do you think? Regardless, the numbers indicated that Nyquist would not win the nine-furlong Kentucky Derby. On Saturday, he’ll run in the Preakness, which is a 10-furlong race. The numbers again say “No,” but this horse has a calmness about him that’s rare. We'll have to watch the race and see how it turns out!